Shown above at 5.5 months of age. George has a beautiful head with square muzzle and soft expression carried on a lovely arching neck that rises from well-laid shoulders with upper arm of equal length. A prominent prosternum carries back through an excellent ribcage and short loin topped by a perfect topline. Bone is ample; feet are tight. Movement is perfectly sound coming and going; sidegait effortless with lovely reach and drive. Wonderful temperament. George is now retired from the show ring and makes his home in Connecticut with a long-time Talbot Hill family. He grew to be 15.75 inches following the specialty in Phoenix and as much as I loved this dog I made the difficult decision to part with him and let him live a wonderful life as a companion. 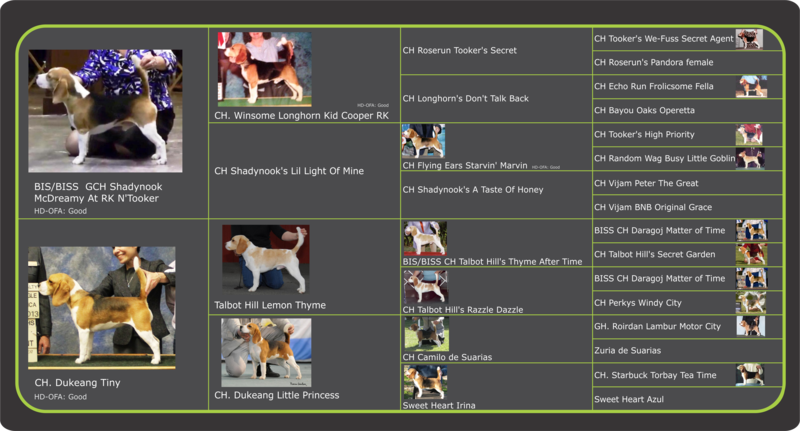 Tiny’s first litter produced some beautiful beagles and gave me some good clues for selecting the sire for her second litter.